The last time I used scented nail polish was circa 2001 when these Bonne Bell Cosmic Nails were all the rage (anyone else remember them?). However, while Galactic Grape was certainly delicious at the time, Revlon has now come along and reinvented "traditional" scented nail polish with the recent release of its Parfumerie Collection. Housed in chic glass bottles with round caps, the polishes are reminiscent of old school perfume bottles. Perfect for displaying on a vanity! The product inside does smell like typical nail enamel (unfortunately there's no getting away from that) but once applied, it dries down to a unique fragrance that can be smelled even under topcoat. 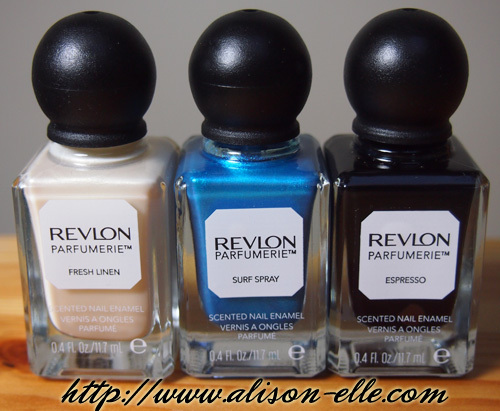 Revlon sent over a few polishes from the Holiday Collection (good news for fans - there will also be a Spring Collection available March 2014 and a Summer Collection available July 2014). I received Fresh Linen, Surf Spray, and Espresso. Fresh Linen is a pearlescent off-white polish that ended up being quite difficult to work with. My swatch is 4 coats but it was still streaky with visible brush strokes. The scent was okay but not what I think fresh linen should smell like. Instead of being light and crisp, it smelled extremely strong and more like dryer Bounce sheets or highly perfumed laundry detergent. Surf Spray was easier to work with though not as vibrant on the nails as I thought it would be, even with 3 coats as above (Sally Hansen Calypso Blue is similar but more opaque). The scent was much lighter than Fresh Linen and is hard to describe. It's pleasant but I guess I thought it would smell salty somehow so was surprised when it didn't. Espresso is a black creme that went on smoothly and was opaque in 2 coats. This scent was also quite light, kind of of like coffee beans. I think of the three I have, it's my favourite fragrance but unfortunately I don't wear straight black nail polish that often. Fragrance, like nail colour, is an accessory and the Parfumerie Collection can even act like your daily perfume. Revlon also suggests layering complementary fragrances by painting an accent nail in a different shade/scent which I think is a cool idea. For me personally, I found myself sniffing my nails a lot and felt a little weird about it so I don't think scented nail polish is an everyday product for me. I will probably whip them out occasionally when I want to add some fun to my manis. Find the Revlon Parfumerie Collection for $6.95 CAD at select drugstores and mass retailers, including London Drugs and Shoppers Drug Mart. It's been a long time since I've used one (like over a decade) so this was a nice re-introduction to them! I've never tried scented nail varnishes! They're a bit weird at first but kind of fun! Interesting idea. I'll have to check them out! I've never seen a scented nail polish! I have to check this out. The bottles are super pretty... I love the retro look! Plus I agree with you on the colour of Fresh Linen. Despite how annoying it was to work with I think having such light nails was pretty cool. Hope you get it! These shades look beautiful! Although if I loved the colour, I would hate to be turned off by the scent.. I'll have to check them out.